When beautiful, blond Sheila married the charming, handsome Blackthorne, she was convinced she had found her perfect soul mate, and helped him attain the privileged life of the country club set. But behind Allen's smooth facade, she discovered a violent, controlling sociopath -- a liar, a scam artist, a sexual deviant. When she finally fled with their two young daughters, she was skeletally thin, bruised, and beaten. Although Sheila recovered and remarried, she still felt she was doomed. Joyously pregnant -- she and her new husband expected quadruplets -- Sheila still feared Blackthorne would use his millions and power to track her down. As did her killer, who left her in a pool of blood marked by the tiny footprints of her two-year old toddlers. Could the authorities ever link Sheila's murder to Blackthorne himself? Was his true obsession high-stakes golf and his extravagant pink mansion -- or was it to destroy Sheila? Following a trail of deception from Oregon and Hawaii to Texas and Florida, Ann Rule gained complete access to Sheila's family, friends, and neighbors, as well as to the detectives and prosecutors on the case. 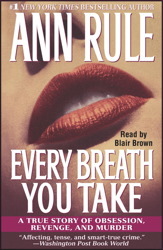 With Every Breath You Take, Ann Rule has written a heart-pounding account of obsession, revenge, and murder that will enthrall listeners from beginning to end. Sad story. I was so happy to find out he was held accountable for his horrible actions.